When suicide has become an epidemic, how can you save the youth? 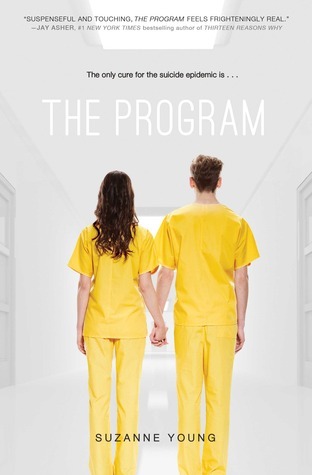 I find it hard to write something about The Program by Suzanne Young. I was really curious when I started. Teen suicide, constant vigilance, sounds to me like an on the tip of your seat kind of book. I did not think it was this way though. It felt like a disappointment, also I got depressed from this story and it made me glad when it was over. Which – to me- does not sound like a good thing. Though the story is well written and the characters are pretty well developed. It was well thought through, the characters had read emotions, fear, depression, love, etc. The build of the story was well done. It was not just the start – Sloane hiding her true feelings – and then ending when she enters the worst place possible – her getting into treatment – but even moves on through therapy, then her restarting her live and ruining it again. Maybe I did not get the earnest of the situation or something, but I really felt like most of the reactions were just too extreme. Or maybe I just have to read the next book too. I have no idea, so I will read The Treatment as soon as I can put my hands on it and have time, because I got confused by it. This entry was posted in Book Review and tagged Book Review, Dystopia, Fantasy, Mystery, Romance, Science-Fiction. Bookmark the permalink.